Israeli Prime Minister Bibi Netanyahu returned to Washington this weekend for his annual love fest with AIPAC, the American Israel Public Affairs Committee, which is holding its annual Policy Committee meeting Sunday through Tuesday. President Obama followed up his speech to his Arab Spring presentation at the State Department, Thursday, by reiterating his comments on Israel at the AIPAC conference Sunday morning. The President’s speech Thursday provided an overview of the changes now sweeping the Arab world. Late in that address, Obama turned to the Israeli-Palestinian conflict. Unfortunately, in linking the changes emerging from the Arab Spring to the future of the Palestinian Territory, the President was playing with a very bad hand. He is a man locked into the rhetoric of the past, honed over decades by Israeli propagandists and Israel’s many friends in the US. The President is a terrific orator. But his rhetoric in this speech needs a careful exegesis to bring out its blatant contradictions. It is not easy to please Israel’s many friends in the US while attempting, rather desperately, to balance the suffering and the hopes of Israel and the Palestinians. He did not succeed. Note carefully how he illustrates the “two sides”, trying, unsuccessfully to balance the suffering of an occupier with that of the occupied. The Israeli suffering he cites is that of children who live in fear of dying. His example of Palestinian suffering is more abstract, the humiliation of occupation and the quest for nationhood. The bombing of Israeli buses is from the past; the suffering of Palestinian children, which the president does not specifically mention, is existential, ongoing, constant and a daily threat with no end in sight. President Obama said he would talk about “security and territory”. He would “put off” the sensitive issues of refugees and Jerusalem, the same sensitive issues negotiators have “put off” for decades. And what is “symbolic” about the UN recognizing a Palestinian state? It is not “symbolic”; it is a legitimizing action on behalf of the Palestinians just as much as the UN’s creation of the Israeli state in 1948 was a legitimizing action. Palestinian leaders will not achieve peace or prosperity if Hamas insists on a path of terror and rejection. And Palestinians will never realize their independence by denying the right of Israel to exist. The President was talking about UN recognition before he moved quickly into the issue of Hamas which he insists on calling a “terrorist” organization. The trouble with tossing in the “right to exist” phrase, is that Obama ignores the fact that nations do not have the “right to exist”. They simply exist within borders that their neighbors accept as legitimate because of historical circumstances. There are no “rights” involved. It is embarrassing for our president to allow himself to be dragged into using the Zionist “right to exist” shibboleth (See Judges 12 for the term’s origins.). As for Israel, our friendship is rooted deeply in a shared history and shared values. Our commitment to Israel’s security is unshakeable. What exactly is this “shared history” and what exactly are our “shared values”? Modern Israel’s history begins in 1948. Aside from pushing the UN to recognize the state, and selling it arms, what have we shared? OK, we did share the pragmatic belief that Israel was our bulwark against communism in the Middle East. Obama again, in remarks after the two-hour meeting, noted that Israel was a “Jewish state” making no reference to the fact that it was also composed of a significant minority of non-Jewish citizens. It would be as if a foreign leader congratulated the US. for being a Christian nation. It sure would make John Hagee happy. When Obama bragged, in his speech, about the US killing of Osama bin Laden, he was providing a further example of the values that Israel and the US share. Our Navy Seals killed an unarmed man who could have been sedated and delivered to the American judicial system. Was that option even considered in advance? A trial for Osama bin Laden would have been more consistent with our American values than the practice of assassinating enemies, a standard we learned from our Israeli friends, who have long killed their opponents by assassinations. In his speech, Obama asserts that “every state has the right to self-defense”. Israel must be able to defend itself – by itself – against any threat. Provisions must also be robust enough to prevent a resurgence of terrorism; to stop the infiltration of weapons; and to provide effective border security. The full and phased withdrawal of Israeli military forces should be coordinated with the assumption of Palestinian security responsibility in a sovereign, non-militarized state. This is a convoluted sentence that could be construed to suggest that when Israel withdraws its military forces from the Occupied Palestinian Territory, it will continue to provide “security” for the new sovereign state of Palestine, which will not have its own military forces. Or, does the sentence say that Palestine will be left with no defenses? Difficult to tell from this sentence in what was reported to be some frantic, last minute speech revisions. Whatever it was intended to say, the defense exception for Palestine is a stunningly ugly example of Obama’s embrace of Zionist–as in, whatever is best for Israel–values. Sixty-three years ago, a 13-year-old Palestinian boy was forced to leave his home in the Galilean city of Safed and flee with his family to Syria. He took up shelter in a canvas tent provided to all the arriving refugees. Though he and his family wished for decades to return to their home and homeland, they were denied that most basic of human rights. That child’s story, like that of so many other Palestinians, is mine. Many are questioning what value there is to such recognition while the Israeli occupation continues. Others have accused us of imperiling the peace process. We believe, however, that there is tremendous value for all Palestinians — those living in the homeland, in exile and under occupation. . . .
Our quest for recognition as a state should not be seen as a stunt; too many of our men and women have been lost for us to engage in such political theater. We go to the United Nations now to secure the right to live free in the remaining 22 percent of our historic homeland because we have been negotiating with the State of Israel for 20 years without coming any closer to realizing a state of our own. The Barack Obama who said in his May 19 speech that the US “will oppose an attempt by any group to restrict the rights of others”, is not the Barack Obama who dismisses the Palestinian appeal to the UN General Assembly as merely a “symbolic action” designed “to isolate Israel”. The Obama speech was both a missed opportunity and a sad failure. 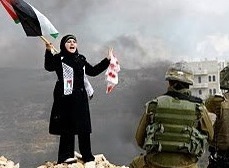 The picture of the Palestinian woman with a flag at the top of this page, and the picture of Mahmoud Abbas, are from Intifada Palestine. Thanks for parsing Obama’s speech. I didn’t see all of it, but am glad he put Israeli-Palestinian peace in the context of the “Arab Spring.” I guess I glossed over most of usual pro-Israel language, assuming that he couldn’t say much in view of the need for American Jewish support for 2012. I’m actually more hopeful that Bibi’s frenetic over-response (call to Clinton; “lecture” to the President about being realistic) gives Obama the opening he needs to frame matters differently for the upcoming UN debate. To wit: 1) noting that the PM listed the 1967 borders as “indefensible,” the President and his aides could now make a long list of Israel’s actions since 1947 that really are indefensible under international law; and 2) noting Bibi’s references to “facts on the ground,” Obama could remind Israel that a) those “facts” (i.e. settlements) really are being illegally constructed in the first place and b) if Israel could move 750,000 Palestinians to the north and east in 1948-1949, it really could move a mere 300,000 settlers south and west back into Israel. If Bibi over-played his hand, maybe some realism will settle in! Thank you for this insightful enumeration of Mr. Obama’s many contradictory remarks. For all those who continually affirm Israel’s “right” to exist or who insist that Palestinians must recognize Israel’s “right” to exist and even now to recognize Israel’s “right to exist as a Jewish state”, I say that what is being asked is approval of the destruction of the Palestinian homeland and the continued subjugation of an entire people. It tells all Palestinians that it was “right” to terrorize, massacre and dispossess them in 1947-48. The ethnic cleansing of Palestinians both within the 1949 armistice lines was deemed necessary so that a state free of Palestinians be formed. A further sequel to this wish is the continued dispossession of Palestinians both within Israel and the occupied Palestinian territories. No state has a “right” to exist and it is only states that recognize the existence of other states. An unintended consequence Mr. Obama’s insistence that Hamas recognize Israel’s right to exist is an implication that he thinks that Palestine is already a state! “The bombing of Israeli buses is from the past” dont anti-tank rockets count? “Delegitimize Israel”? How does recognizing a Palestinian state within the 1967 borders “delegitimize Israel?” So you do not support the immoral “right” of return? I was sick. However, I don’t recall any previous President or official of the State Dept. even mentioning the Palestinians. I am also nauseated that Net will speak to the congress. Who the hell is running this country? The tail continues to wag the dag and the Palestinian Gulag continues, the people, real people still deprived of civil and human rights. I believe you do have it right, Jim. And Zionism is the big problem, because so much of the American public, the church-goers, have Zionism built into their New Testament religion. Without usually calling it by that name, they nevertheless honor it by praying to the god of Israel, who became the Christian God, by hearing readings from the Gospel of Matthew and from the Old Testament about the “chosen people”, and even from some of the hymns they sing. The fear of being called anti-Semitic helps deter them from in any way objecting to the idea that Palestine is the chosen land for God’s chosen people. Thus they are scarcely concerned about the fate of the Palestinians and its refugees. A great and courageous job of analysis. Unfortunately, Zionists (Christian and Jewish) will contiue to support the Zionists. I heard Netanyahu say that this is the last chance for Israel to claim its “rights.” But does Obama really support the destruction of the Palestinian community in order to guarantee the “right” of Israel to land that has been occupied by Palestinians for thousands of years also? Is this really what God wants, to put it in religious language? I am really disappointed by Obama’s speech. This kind of rhetoric will only continue the violence and prolong the suffering on both sides. Did the UN actually create the State of Israel? Or did the early zionists simply declare it? Thanks – it explains my discomfort with Obama’s speech. Declaring its borders is an essential beginning in serious negotiations. I wonder if the Government of Israel has ever directly asked Hamas to change its constitution and accept the State of Israel, or is their stated certainty that such acceptance would never happen an excuse to keep Hamas at arms length and an enemy? So, what can we do about it? How will we get the President and the congress on the right track? Obviously Obama stands behind the criminal takeover of Palestine. Is there any one in the government who can see the injustice clearly.? One would expect the Palestinians to hate the Israelis, considering the atrocities perpetrated against them, and continuously. It is a shame that out of their frustration, missiles were sent into Israel, it only gives the Israelis an argument, what foolishness. But on the other hand, they do not admit to their own atrocities, to the astounding number of Palestinians killed, including children, and sometimes quite arbitrarily. The Palestines are living a holocaust. A great commentary on the Speech. Thank you for your insight. “The Palestines are living a holocaust” ? With better economic and heath stats than almost every Arab nation in the Mid east? Check their life expectancy and compare it to Egypt, Syria etc. They also have one of the fastest growing population on earth. Yes, they also have political issues, but this is not a “holocaust”. Seriously, you make reasoned debate impossible with statements like that. Thank you for this analysis. It is obvious that the US is incapable of being an honest or credible broker and is only seeking Israel’s continued occupation under new packaging. The UN Resolutions 242 and 338 have already established that the borders of israel should be those of 1967, with “minor” adjustments. President Obama has succumbed to AIPAC and has effectively given a green light to “expand” them to whatever Israel wishes. The fact that the Palestinian David is supposed to be negotiating with the israeli Goliath will not enable the 2 parties to have any meaningful dialogue. It is perscribed to give Israel more time to build even more settelements. ALL settlements are illegal and this should not be negotiable. No “unequal” land swaps are acceptable for the same reasons. How could any rational person accept the argument that Israel needs security guarantees, when it defeated the Arab armies in every single war and possesses a monopoly of nuclear arsenal? On the other hand, it is Palestine that actually needs security guarantees and should demand them. Palestinians have recognized Israel since 1993, or even earlier. Obama should demand that Israel recognize Palestine. Netanyahu’s car-salesman jargon about Israel’s so-called, “non-defensible” borders reminds one of Nazi Germany’s expansionist drives founded on the same logic. Palestinian right of return to Palestine Pre-’48 is according to UN resolution 194 of 1948/49 and it has to be honoured for those choosing to return or to be compensated. Neither Israel, nor its side-kick, has the right to ignore this resolution. East Jerusalem is “Arab” and the “eternal capital” of Palestine, as part of an undivided East-West entity of “Greater Jerusalem”. If Israel rejects peace-with-justice, then a ONE-STATE solution becomes the only logical path to take. Regardless, the Palestinians should never, never, never allow the honeyed promise of renewed “peace process” stop them from relentlessly seeking recognition as an independent state of Palestine, come September, 2011.